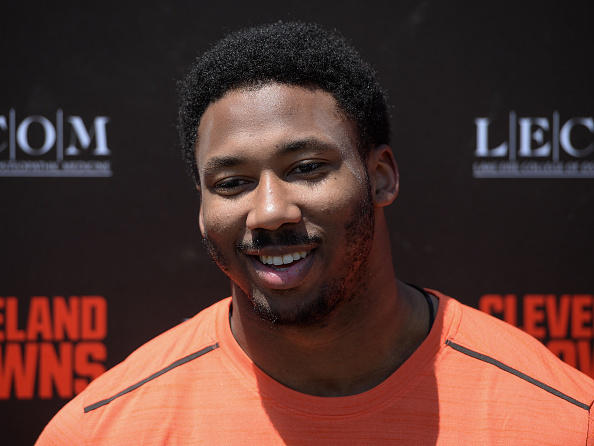 BEREA, OH — Browns defensive end Myles Garrett isn’t really one for talking off the field. During his first year in the NFL, he’s generally let his play do the talking. 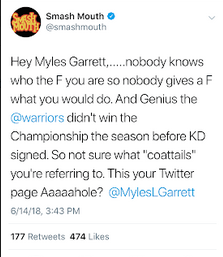 So when Garrett spoke out passionately against Golden State Warriors star Kevin Durant for “taking the easy way out” and joining the team he couldn’t beat two summers ago, it was somewhat surprising. In the aftermath of the Cavs dropping a second consecutive NBA Finals to Durant’s Warriors, those remarks play well here in Cleveland. Elsewhere, not so much. Fortunately, the former No. 1 overall pick didn’t take the attack personally, letting his Twitter followers know he still plans on listening to the soundtrack to Shrek, which features two Smash Mouth songs. Garrett’s clever response seems to have remedied any beef between the two parties and apparently earned him some new fans in the process. YES!!!!! Like him now. Amazing reply!! !